﻿ Foggy to lead Sauber WSB effort? Updated: Tuesday, November 6: Sauber is believed to be switching away from plans for GP racing to go WSB racing instead. And there are suggestions that Carl Fogarty will act as the bid’s figurehead. Nigel Bosworth announced on Tuesday that he was leaving his role as team manager at Ducati Red Bull. He has not disclosed where he will be going but MCN believes he is included in this Sauber deal. At this stage there are no firm details but our investigations have already revealed the Swiss firm HAS applied for a slot on the WSB grid next year. No one directly involved in the project will comment as we understand they have all been asked to sign contracts forbidding them from discussing it. Sauber has been involved in motorsport for 30 years and closely related to Formula One since 1993 – all of that experience has led to the development of the 990cc three-cylinder motor that was seen being tested by Niall Mackenzie at Sepang in Malaysia last week for the first time. If the bike is going to be eligible for WSB the first thing that is going to have to be changed is the 990cc capacity – triples can only be run at a maximum of 900cc in WSB. 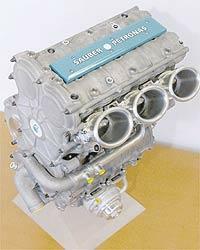 This could easily be done by sleeving the cylinders down to bring it under the 900cc limit. The bike will then have to be entered under the " first time entry to WSB " clause that exists and has been used by Benelli to enter the Tornado this year. What this means is that 75 fully-working examples of the bike will have to be built by January 2002 and inspected by technical experts from the FIM before another 75 have to built in June 2002 to make the 150 units needed for homologation rules. The mouth-watering consequence of this is that these 150 machines may then be available to buy. There is no WSB rule that makes it compulsory for these to be road spec machines – they could be over-the-counter race bikes available to anyone with the money. Foggy denies all knowledge of the project to bring the high-tech three-cylinder motor to WSB next year.
" I have no idea where this has come from – I don’t know anything about it, " he said. But our investigations have revealed Sauber has not only applied for a starting slot on the grid for WSB next year (something that it said it wasn’t ready to do in the new four-stroke GP class), but that Foggy will act as firm figurehead. Steve and Lester Harris of Harris Performance are also thought to be the men who will sort the chassis. If Foggy does make the move to Sauber it will signal an end of his links with Ducati. It’s understood the money from the massive Petronas group (a Malaysian oil company) will pay for the research and development costs involved in getting the project up to speed. If these rumours prove true, they go against everything Sauber had been publicly planning. And you have to ask why the bike has been paraded so far before a GP audience? When asked about the project, Sauber test rider Niall Mackenzie said: " As far as I am aware the bike and engine is for GPs. The project is geared around the new four-stroke GP rules. " No one from Sauber has so far been available to comment.